a video call on Skype. DO NOT expect any honorable behavior from the scammers. they see fit for their scamming operation! Asking the scammers for documentary identification proof? 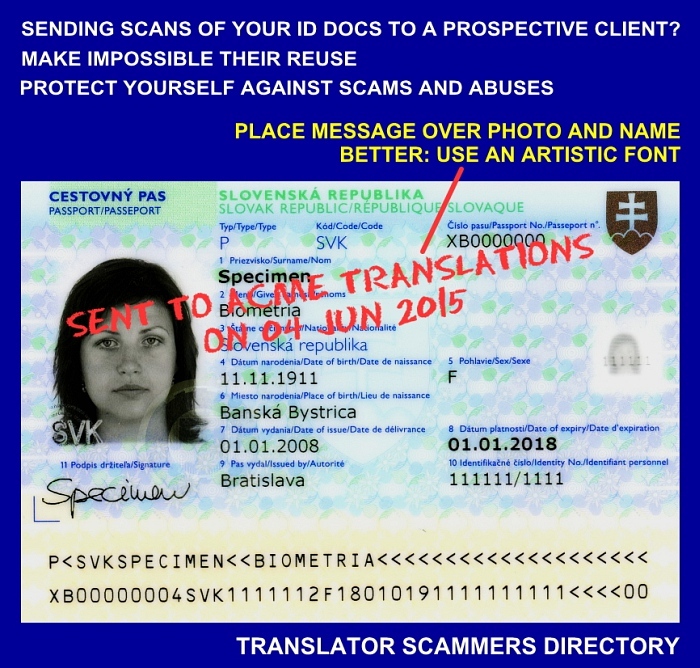 "You (The Translator) have to send a copy of his/her certificates, ID..."
When suspicious about some scammer's identification, you should never ask for a simple copy or scan of a documentary identification. 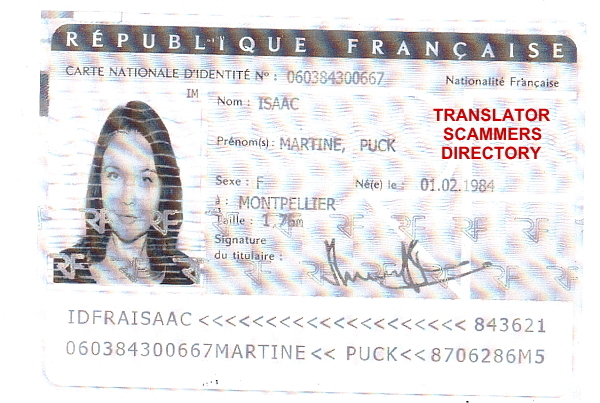 Because pictures of ID cards are so widely available in the Internet, all scammers have to do is to copy one of these pictures, create a Gmail address matching the name on the picture, paste this information on a stolen CV and, voilà, he/she in business and ready to make proof of his/her new identity. 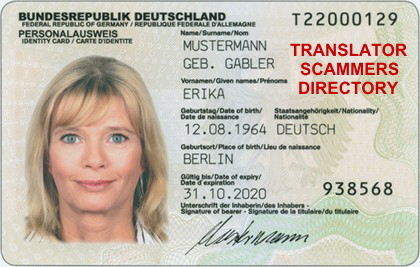 Also, scammers may have tricked real translators into providing them scans of their own identification documents ("because of the ID theft going around in the translation community", they'll say...). Bear also in mind that images or PDF documents can be easily manipulated and forged. 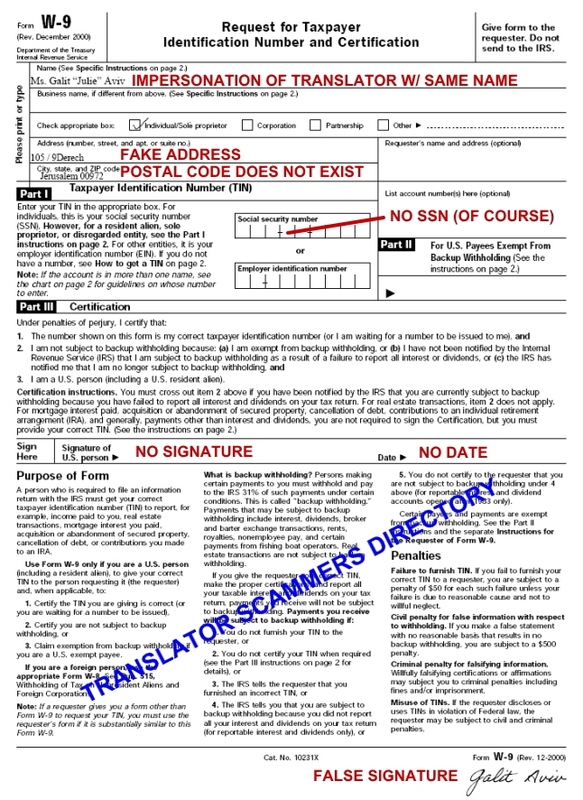 Also, a smart scammer may ask the legitimate translator for the data needed to fill out the W-8/W-9 tax forms (USA) and use such data to provide his/her client with a "genuine" form. Fake W-8 Form (USA) "signed" by a "Gloria Fiorantino"
Keep in mind that scammers will promptly violate any honor system they may be asked to live by: they will quickly use fake names and false signatures on any document or grossly misrepresent themselves to achieve their purposes. Your company is the first to ask for official documents to check my identity. I have never sent personal documents by email such as my photo or university certificates this is because the net is always being hacked. I am sorry to receive such a request from you. 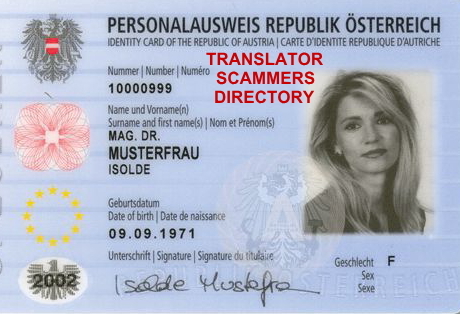 — Scammer "Gabriele Broszat", after being asked by "her" victim to provide proof of "her" identity. 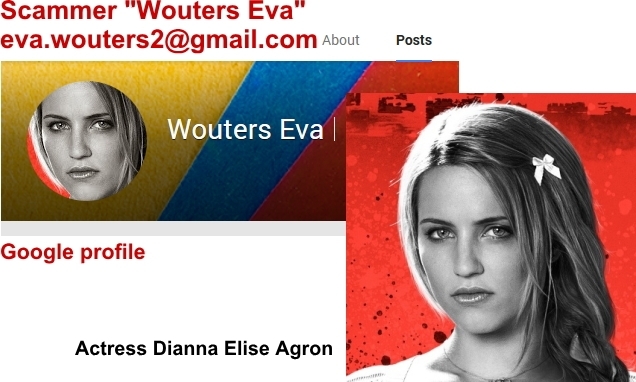 First, "she" gave lovatostefan@gmail.com as "her" PayPal ID. 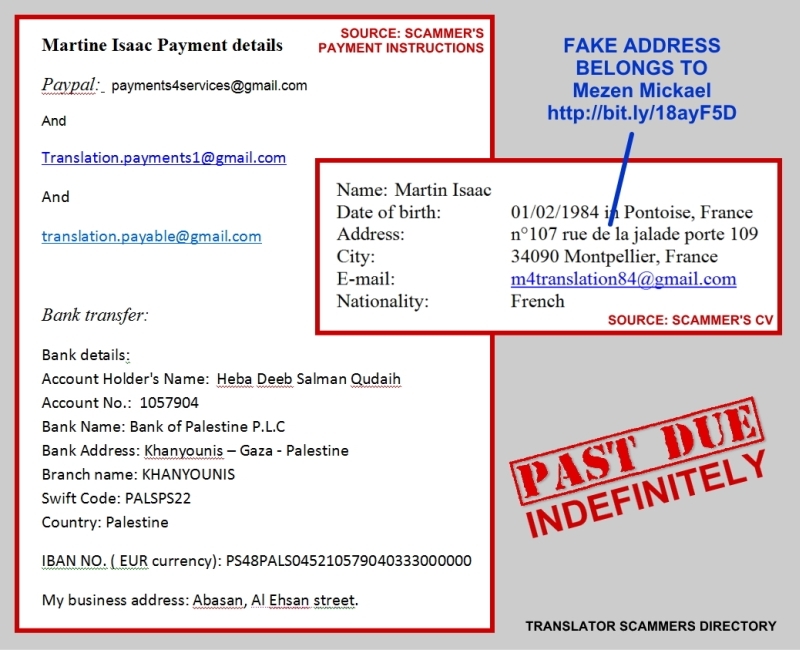 When questioned about "her" use of the same address used by another Arabic translator, she provided liancarmen@gmail.com as another PayPal ID. 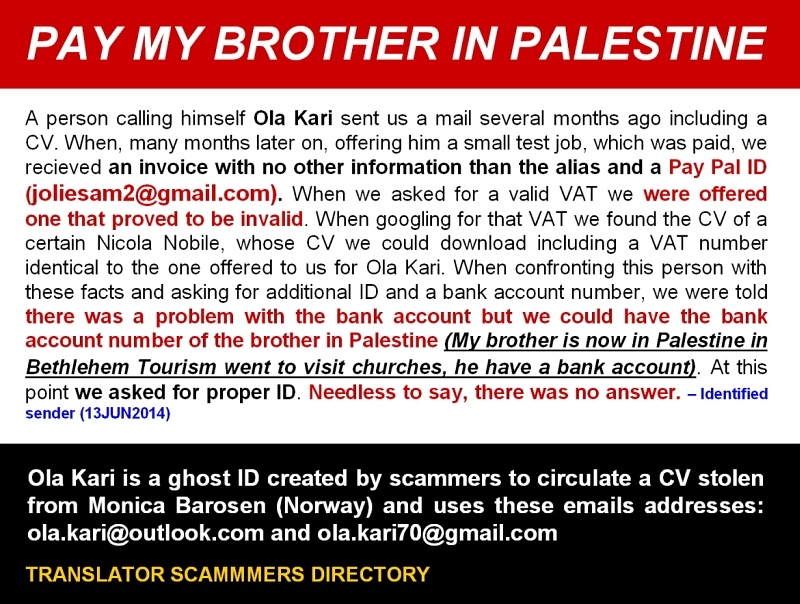 When questioned further, she provided gabriele.broszat@gmail.com as "her" PayPal ID. Good news: scammer is still waiting for "her" money! 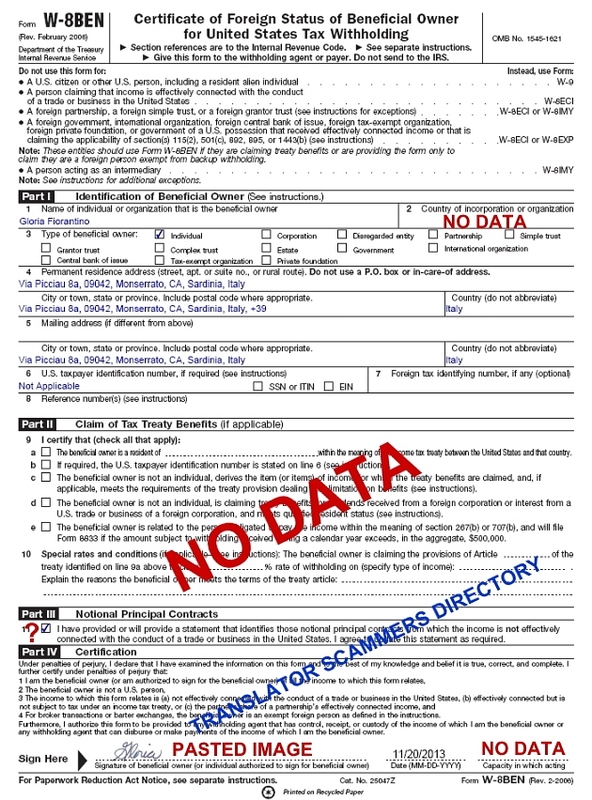 When in doubt, ask the scammer for certified true (i.e., notarized) copies of his/her documents, or a Notarized Identity Verification statement (see below). Of course, for someone residing, for instance, in France, the certification/notarization should be done by a French Notary, and not by a Notary in Abu Dhabi, "because I'm visiting some friends here...". 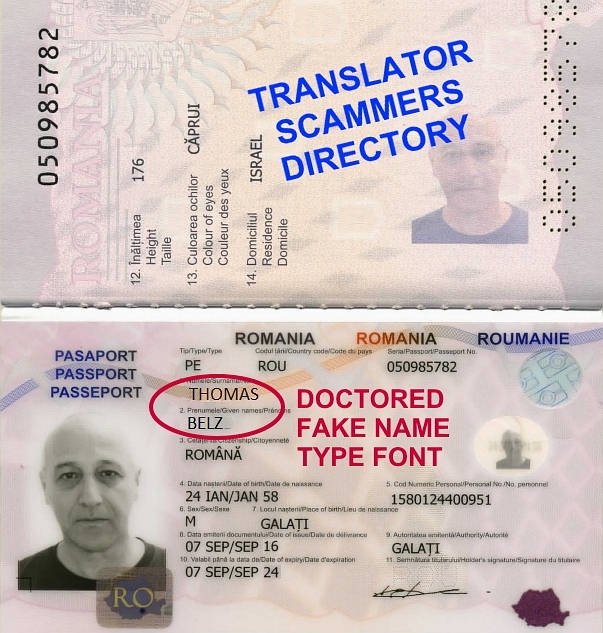 One scammer, impersonating a translator in USA, failed to send a W9 form to the client and tried to use the "friend and travel" trick: "I will send you my friend's details to send money via MoneyGram, as I am on travel (!!!)". 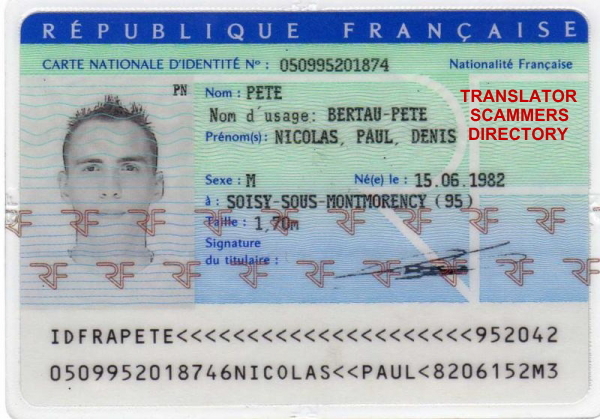 Below, we show you some documentary ID pictures collected from the Internet. Some of these "ID cards" don't even legally exist. Can you spot the fake ones? 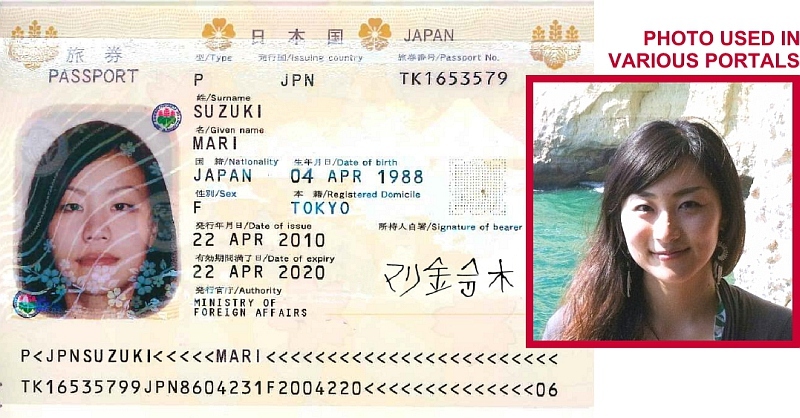 An excellent resource by Wikepedia on the various identity documents used worldwide. Any documents, certificates, diplomas, professional references, etc. 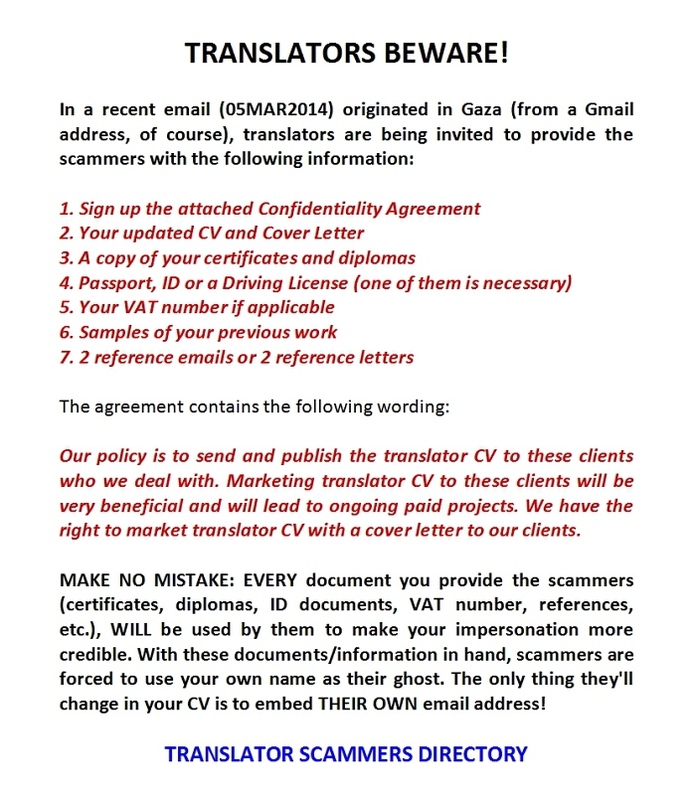 sent to the scammers WILL be used by them to impersonate you with a higher degree of credibility. Do NOT give scammers the rope for them to hang you! Sending scans of your documents/credentials to prospective clients? 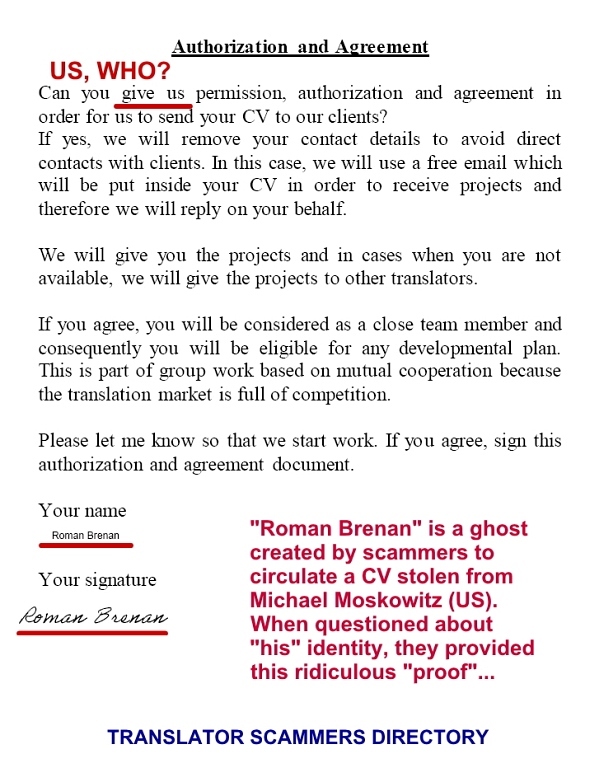 To confirm the identity of a translator — in case of well founded doubts about his/her identity/nationality/place of residence provided online or on a CV — ask him/her to have this statement notarized by an official notary public. And, because the CV/Identity theft is based on the scammers using their own emails, ONE EMAIL ADDRESS SHOULD BE INCLUDED IN THIS FORM. 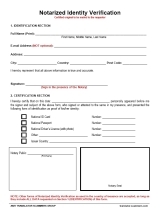 After certification by a Notary, the original form should be MAILED to the requester. For a higher degree of security, this form SHOULD NOT BE SENT by electronic means (i.e., scanned, emailed of faxed). Contact us for more information (of course, we'll respond only to genuine translators and translation companies). 10 point Guide to analyzing prospective new Clients (a very useful reading, by Translation Street). Locating the scammers: where is this email coming from? Lookup the email sender's IP and run a geographical search here: utrace.de. Note: Emails sent from Gmail will ONLY trace back to Google IP addresses (in the USA). How can I open / view an email header? Download and read our Report. This email checking tool connects to the mail server and verifies whether the email address exists. 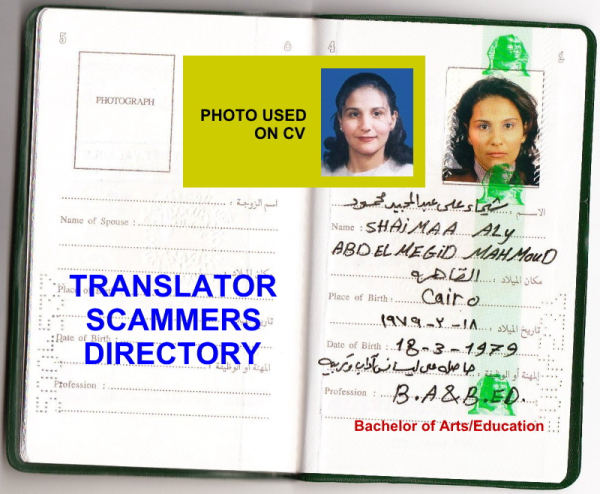 Willing to look legitimate, scammers frequently include a street address on their fake CVs. Checking these addresses is a powerful tool in identifying fake CVs. 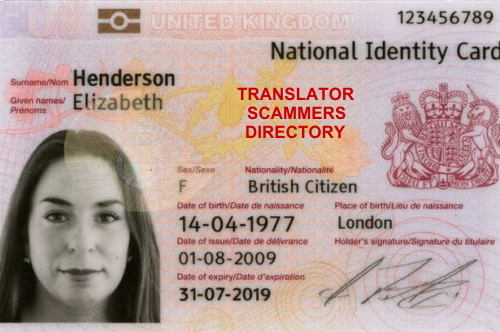 Learn from a freelance translator how to set up a trap to catch a scammer. In a nutshell, he setup a password protected job offer on his website and demanded the interested parties to access it. 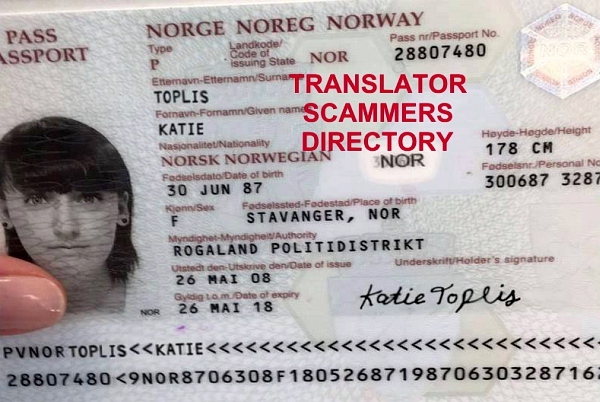 Using the server logs, he was able to find out that the "translator", Vera Kahar, was, in fact a ghost created by known scammers from 24translate: Hamza Mohammed (hamza@24translate.net). Read more. 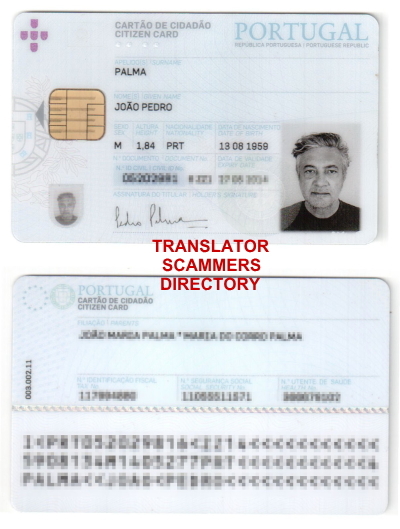 PRADO is a multilingual site with information on authentic identity and travel documents from Europe. It includes information on the validity and on other legal aspects, as well as technical descriptions (including descriptions of some of the most important security features) of these documents. PRADO is organized and hosted by the General Secretariat of the Council of the EU (GSC), in the Directorate-General for Justice and Home Affairs. The International Bank Account Number (IBAN) is an internationally agreed means of identifying bank accounts across national borders with a reduced risk of transcription errors. For the purpose of this website, this checker serves to verify the validity of a bank account number provided for payment. An IBAN (International Bank Account Number) is used internationally to uniquely identify the sort code and account number of a customer at a financial institution. While IBANs are predominantly used in Europe, the following countries also use IBANs — Bahrain, Israel, Palestine Territories, Kuwait, Lebanon, Saudi Arabia and Turkey. The IBANs of each country differ, they may be longer or shorter depending upon local numbering standards. Any bona fide professional or business in France will have a SIRET number. The first nine digits identify the trading entity and the last five digits the center where the business was registered. The first nine digits of the SIRET number make up what is called the SIREN number (Système informatisé du répertoire national des entreprises et des établissements). The SIRET number should appear on all business paperwork and publicity; which includes the likes of business cards websites. If the number is not visible or the business owner is unable to give you a SIRET number, you should strongly question his/her identity. 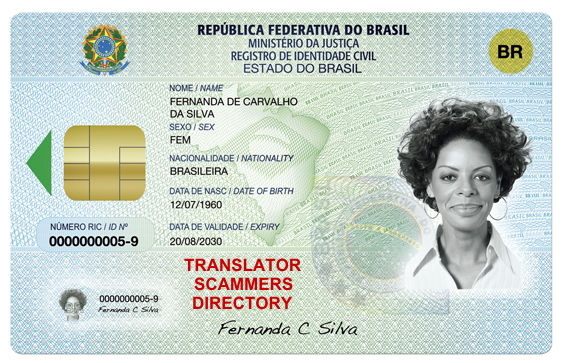 BUT, BE CAREFUL: SCAMMERS MAY HAVE OBTAINED THE SIREN / SIRET NUMBER FROM THEIR VICTIMS! The Central Business Register (CVR) is the central register containing primary data on all businesses in Denmark, regardless of economic and organizational structure. CVR also covers both public and private businesses. This checks the validity of the format of an EU VAT number (Norwegian, Serbian, and Swiss VAT formats are also supported). Note that it DOES NOT check whether the code is currently allocated — this may done by interrogating the EU VIES database (next link). 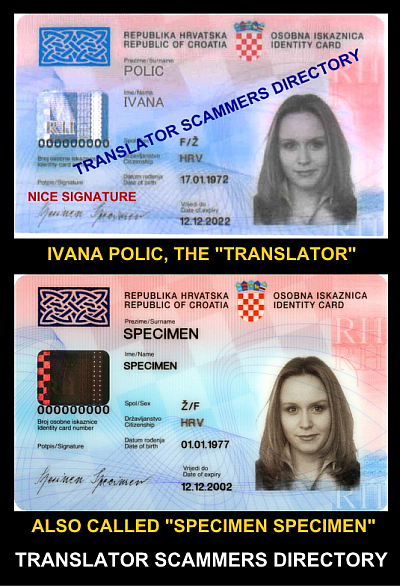 All necessary check digit validation is performed except for the new style French TVA numbers, which are not believed to be yet in use, and the new style Irish numbers. In the European Union, a VAT identification number can be verified online at the EU's official VIES website, it confirms that the number is currently allocated and can provide the name or other identifying details of the entity to whom the identifier has been allocated. It is one of the most reliable sources to validate the professional status of translators in Europe. 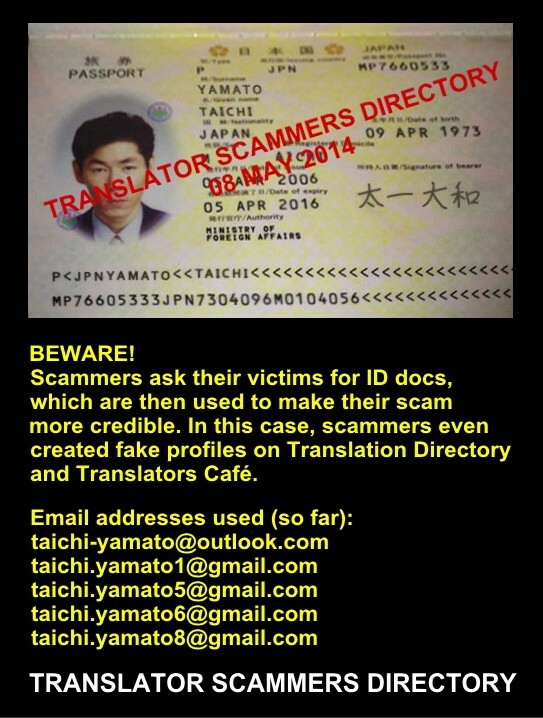 BUT, BE CAREFUL: SCAMMERS MAY HAVE OBTAINED THE VAT NUMBER FROM THEIR VICTIMS! Information and validation of the Value Added Tax Number (VAT) and Business Identification Number (BID/UID/IDE/IDI) in Switzerland. The Data Universal Numbering System, abbreviated as DUNS or D-U-N-S, is a proprietary system developed and regulated by Dun & Bradstreet (D&B) that assigns a unique numeric identifier, referred to as a "DUNS number" to a single business entity. It is a common standard worldwide. More than 50 global, industry, and trade associations recognize, recommend, or require DUNS. The DUNS database contains over 100 million entries for businesses throughout the world, including many translation companies. 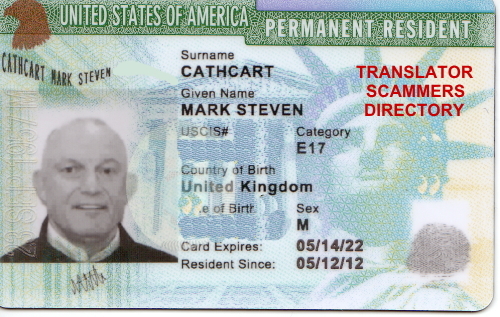 In the United States, a Social Security number (SSN) is a nine-digit number issued to US citizens, permanent residents, and temporary (working) residents. 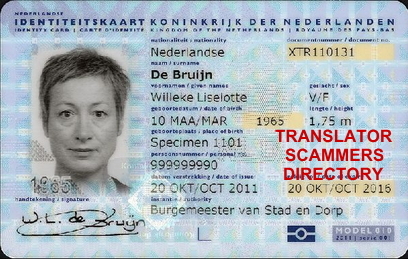 BE CAREFUL: SCAMMERS MAY HAVE OBTAINED THE SSN FROM THEIR VICTIMS! The Bank Routing Number, sometime referred as ABA Number, is a 9 digit number assigned by the American Bankers Association (ABA) to uniquely identify the bank on which payment is drawn. The bank routing number is also referred as the "check routing number" because it generally appears at the bottom of a US check. This function checks the validity of a credit card specified by the supplied parameters containing the card number and card type. Note that this routine does not supply credit card verification functionality, which can only be provided from within the credit card company server. This function DOES NOT capture, log or transmit the input. The International codes section of The Phone Book online (by the British Telecommunications plc) allows you to find the dialling code for a particular Country along with the codes for the major Cities within that Country, or the Country that relates to a particular dialling code. Is it a cell or is it a landline? Check US phone numbers for free to learn the line type and phone company! Scammers love Skype! In their profiles they will tell you all sorts of lies, including their location, which is frequently fake, in a effort to hide their real whereabouts. Skype only displays the username of the person on the other end of the call, providing you with no way of determining where the call originate from. By using your computer's command prompt and some online tools, you can determine a caller's IP address' physical location. Here is another location method; and this is also a nice information about this subject. 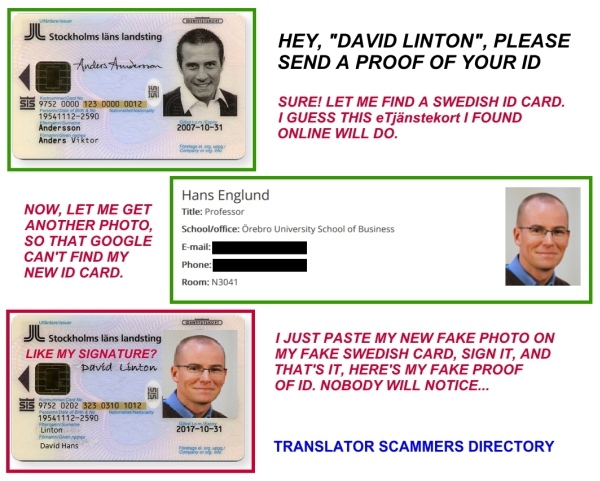 Sometimes, scammers will use images on their fake CVs or online profiles (like G+). Run a search by image and see who does the image belong to. Instructions on how to secure your PDF documents. NOTE: This will NOT prevent your CV to be hijacked by scammers, but it will slow down and make their task somewhat more difficult. To the folks at Country IP Blocks in Prescott, AZ, United States, our heartfelt thanks for their kind support.